The Best Amish Made Furnishings - At the Best Prices! Here is the standard tempered glass inset that we refer to on our rustic hickory whiskey barrel table, our rustic rough oak whiskey barrel table, and our rustic double whiskey barrel table. 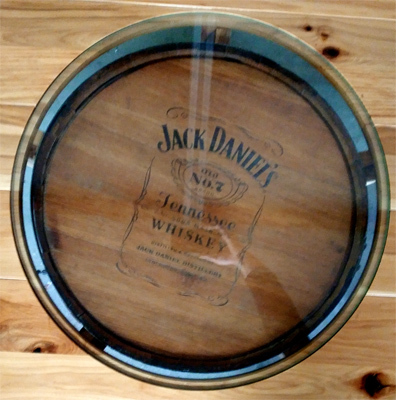 The glass allows you to clearly see the Jack Damiel’s production information on the top of the barrel. Please note the lighter colored circle around the edges of the barrel is the color of the floor beneath it, and apologies for the reflections - you can only do so much with a cell phone camera. As stated in the descriptions of the individual tables, this is how it comes standard, but feel free to ask Roger if you would like to do something different with the opening or not have one at all.